A Bill of Divorcement is notable as Katharine Hepburn's first film but it also marked a turning point in DM's movie career. One of the first contracted actors to balk at studio tyranny, David was released from his contract with WB / First National and co-starred in A Bill of Divorcement as a free-lancer. As he was always in high demand, DM enjoyed a much more lucrative career on his own. Based on the play by Clemence Dane, A Bill of Divorcement is a dated and melodramatic study of divorce and madness in the lives of an English family. Margaret (Meg) Fairfield, (Billie Burke) long-suffering wife of insane and asylum-housed Hilary Fairfield, (John Barrymore) is set to re-marry after having been granted a divorce. While encouraged by her outspoken daughter Sydney, (Katharine Hepburn) Meg's conscience is bothering her. Although Hilary has been institutionalized for fifteen years after being shell-shocked in the Great War, Meg is under heavy family pressure to honor her wedding vows. A difficult situation is made even more untenable when Hilary escapes the sanitarium and arrives at the house. Sydney, realizing that her father (whom she has never before seen) is genetically imbalanced, breaks her engagement with fiancé Kit Humphrey (DM) and remains with her still-impaired and care-needing parent. Meg is thereby allowed to pursue her happiness. 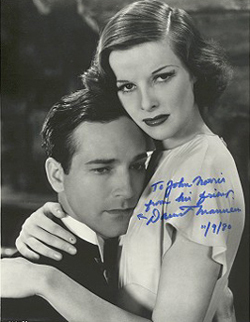 While his part is small, DM is memorable as the debonair suitor and his scenes with Hepburn play well. The opening scene of the film follows him as he, in a tuxedo, scans a Christmas Eve party for his dance partner, Sydney, who floats down an elegant staircase into his arms. He well displays his sore displeasure when Sydney, not wanting to deprive Kit of his desire for children, makes known her fear of the insanity in her family. It is really the relationship between Barrymore and Hepburn that drives the film and the two share some touching moments. Also interesting is the emerging screen persona of Hepburn, who, even in her first film, delivers a strong, fiery performance and commands the viewer's attention from the start. As a final note, Billie Burke is a regular laugh-riot as the much ruffled Meg. Purchase A Bill of Divorcement in VHS or DVD formats through these Amazon.com links and a portion of the sale goes to the David Manners web site. Help support this site with your purchase.